Join me in my studio on beautiful Whidbey Island, at the mouth of the Puget Sound in Washington State. We will dive into color on our first day together while we create samples that will prepare you to design a seamless Garden Jacket over the next 3 days. You will come away wearing a one-of-a-kind reversible piece. While you are here, we will gather round my dining room table - drink wine and eat healthful, yummy food that I have lovingly prepared from my mother's recipes. You will have a chance to walk the beach and gather pieces of driftwood, agates, rusty bits. This retreat is intentionally small so that there is lots of space for you to create as well as one-on-one instruction time with me. I look forward to welcoming you into my home and studio. Open up a world of possibilities in design by learning how to create seamless three-dimensional shapes in Nuno Felt. Throw on a splash of color with this reversible, short Nuno Felt jacket. 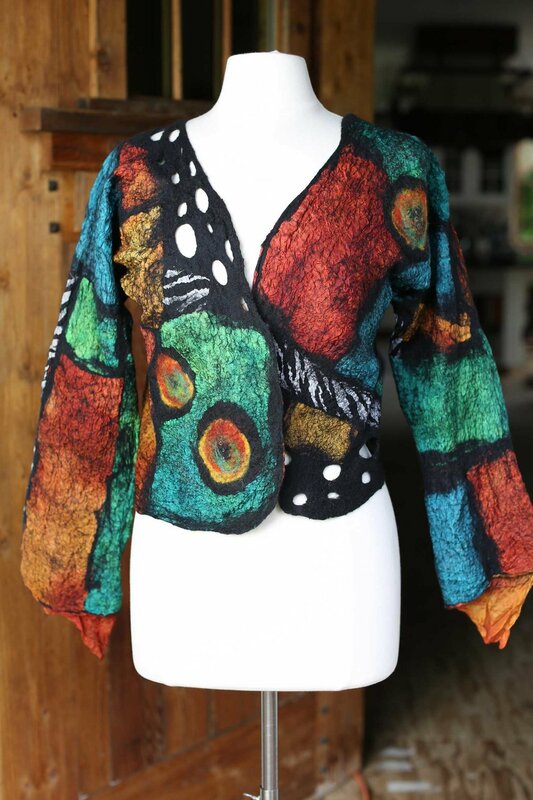 Explore design elements using silk collage, holes and colorful wool accents to create a piece of wearable art light enough to enhance any outfit. Once the basic pattern is created there are lots of possible variations: the front can have a straight box cut or a curved more whimsical look, love asymmetry? No problem! Arms can be long, short, straight or flared. 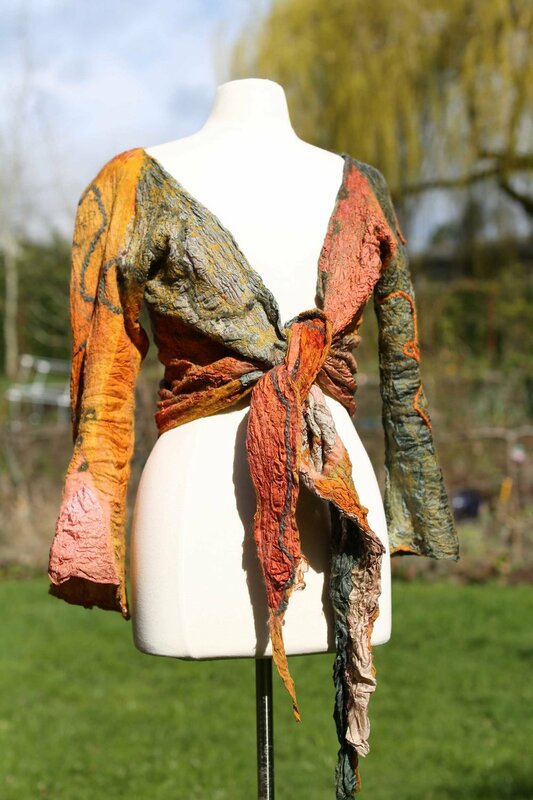 Adjust the weight – use more wool for more warmth, less wool and more silk for a light weight summer evening shrug. The Retreat will begin with a Dive Into Color workshop and of course, discussions of color will be woven in throughout the workshop. Bonus! Can be made on a single table for those with limited working space in their home studio – and of course it is all made in a single piece with no stitching. All tools provided. Participants responsible for bringing materials or can choose to purchase from Beverly during retreat.